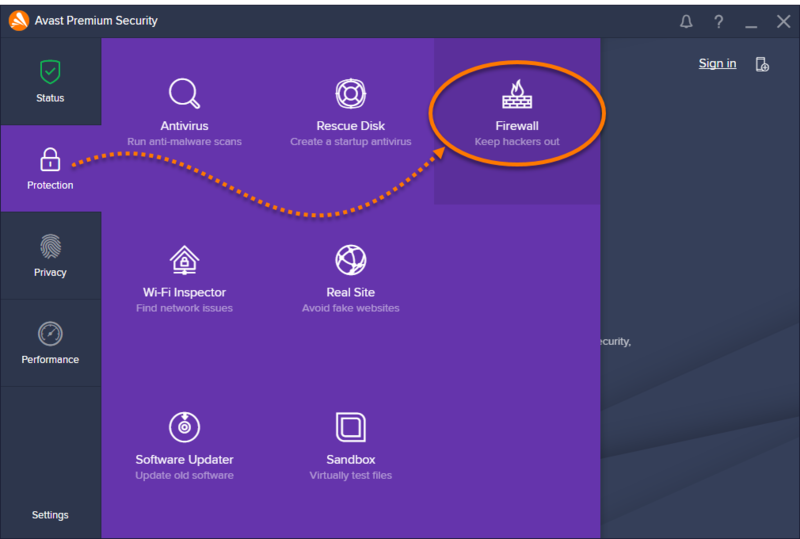 Firewall is a component of Avast Internet Security and Avast Premier, and creates rules each time an application or process starts for the first time. 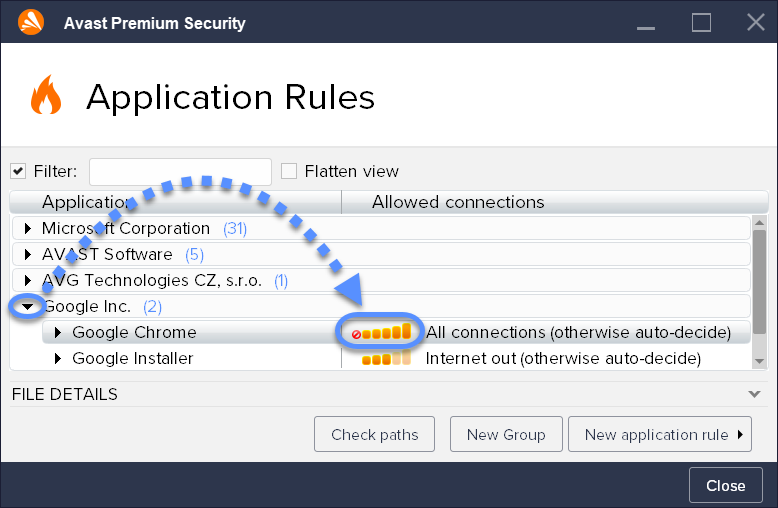 These rules determine how Firewall behaves toward each application or process when it connects to the internet or to another network. Although advanced users can manage these rules or create new ones, we recommend you only modify your Application Rules if absolutely necessary. In most cases, Firewall formulates optimal rules without your input. 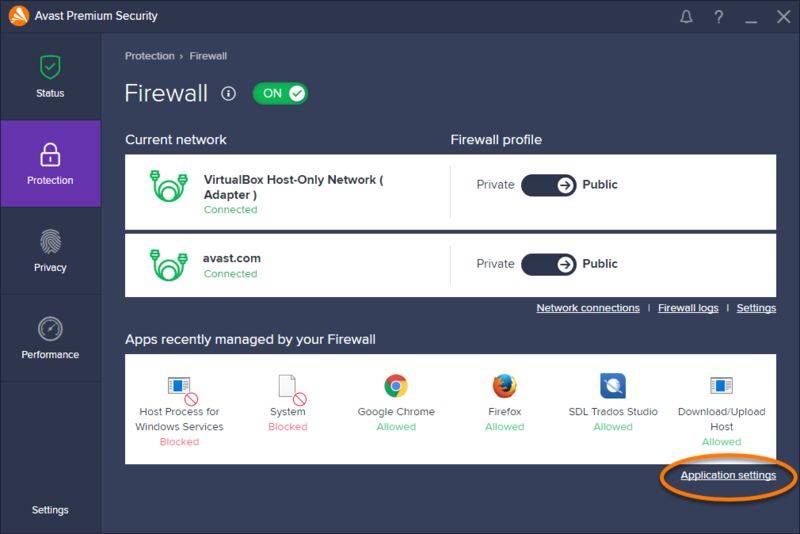 Open the Avast user interface and go to Protection ▸ Firewall. Click Application settings at the bottom of the screen. 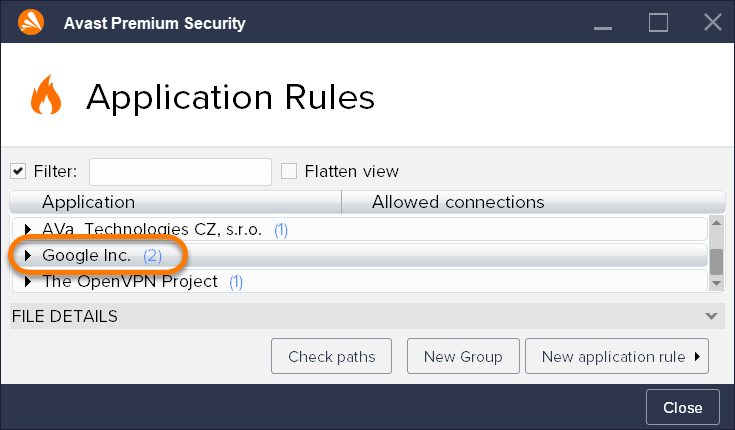 Click New application rule and select a group (vendor). Locate and select the executable file of the application you want to add. Click the group name, then use the orange bars to indicate the level of access you want to allow. To create a new group, click New Group and provide a name for the group. 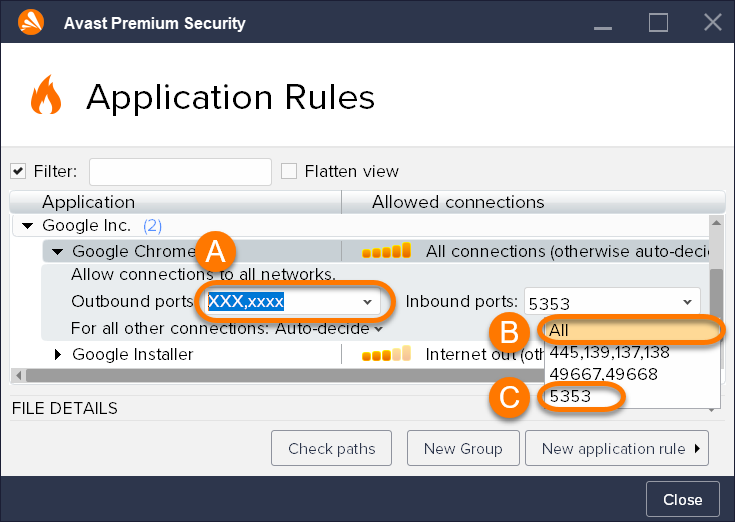 You can set connection allowances for each application or process to determine how strictly Firewall monitors incoming or outgoing communication. One bar (Friends out): outgoing connections with Friends networks only. Two bars (Friends in/out): incoming and outgoing connections with Friends networks only. Three bars (Internet out): all outgoing connections to the internet. Four bars (Friends in and Internet out): incoming connections with Friends networks only, and all outgoing connections to the internet. Five bars: (All connections): all incoming and outgoing connections to the internet. To Block all connections for an application, hover your cursor over the orange bars and click the red block symbol that appears. The networks referred to as 'Friends', are any networks outside of your current network that are considered trusted by Firewall. These networks are automatically identified and exempt from default Firewall restrictions when your current Network profile is set to Private. When Firewall is set to the Public profile, the default higher level of security is applied to all networks, including the 'Friends' networks. Click a group (or vendor name) in the Application column to open the list of applications or processes in that group. Select an application or process to expand its individual communication settings. Default rule: Firewall decides to allow or block connections based on the settings of the active Firewall Network profile (Private or Public). 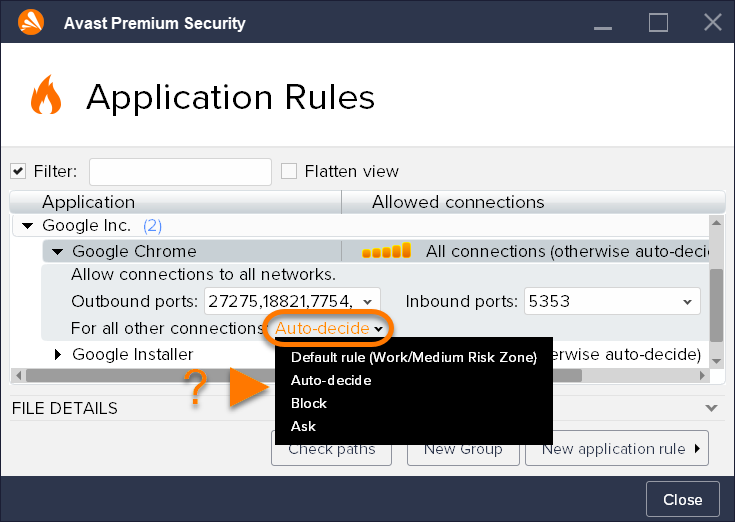 Auto-decide: Firewall allows connections with verified applications, but blocks connections from unknown or suspicious applications. Block: Firewall blocks all other connections. Ask: Firewall asks you to decide if you want to allow or block a connection each time a new request is received. Selecting this option may result in frequent and potentially obtrusive alerts. Private: a lower level of security suitable for when your PC is connected to a trusted network such as your home or work network. This profile enables better connectivity, and permits all communication within the network. Public: a higher level of security suitable for when your PC is connected to a public network such as in a cafe or airport. Because public networks present greater security risks, no incoming communication is permitted when this profile is set. Type specific port numbers into the text box. For multiple ports, separate each port number with a comma. Select All from the drop-down menu to authorize communication with all ports. Select a predefined port number from the drop-down menu. Optionally, configure Packet rules from the Application rules screen by following steps 1-2 above, then clicking Packet rules. 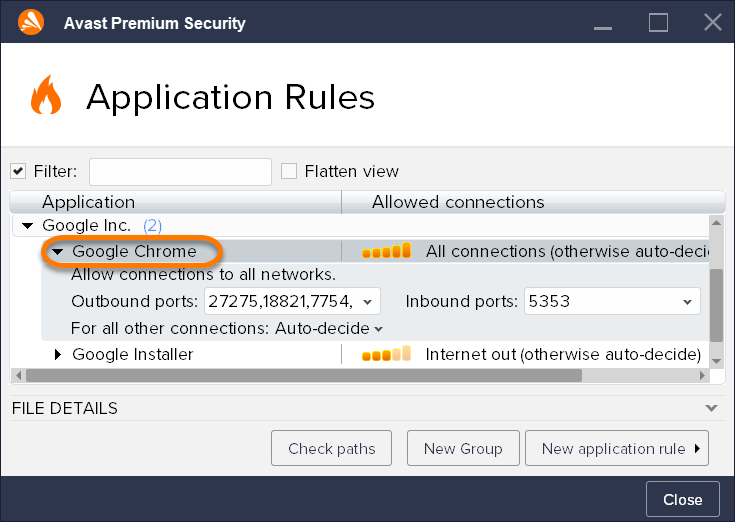 While Firewall uses Application Rules to control traffic according to individual rules for programs or services, Packet rules can also be configured to control network traffic using specified connection parameters. Packet rules enable you to view and manage Firewall rules according to the information contained in network packets, such as network protocols, source or destination IP addresses, or local and remote ports. Different application or process types require different ports. For example, for internet browsers, port 443 is the default port used for HTTPS (secure HTTP), and port 80 is the most commonly used port for HTTP (unsecured), therefore the Application rules port entry is 443,80. For information about the correct network port to specify for an application, contact the application vendor or refer to the application's documentation or support pages.